Looking for Personal Bollywood marriage poster ? Stunningly unique and personal, here end your search at Bollywood posters studio. you just need to select the movie poster you want + your clear hd pics and send us on our email id : bollywoodpostersstudio@gmail.com or can contact us on +919022034923. Rest of work will done by our expert team , you will got your Personal Bollywood marriage poster at your door step. In our unique team of Bollywood posters studio artists will custom paint your faces in any Bollywood movie poster of your choice. Along with the actual canvas, which you can proudly flaunt at your event, we will also supply a high resolution digital scan of the painting. You can print the digital photograph in any size you want and make a fabulous, never-seen-before Bollywood themed invitation cards or decor. Your very own custom Personal Bollywood marriage poster can make an exclusive Bollywood themed decoration that will amaze your wedding guests. 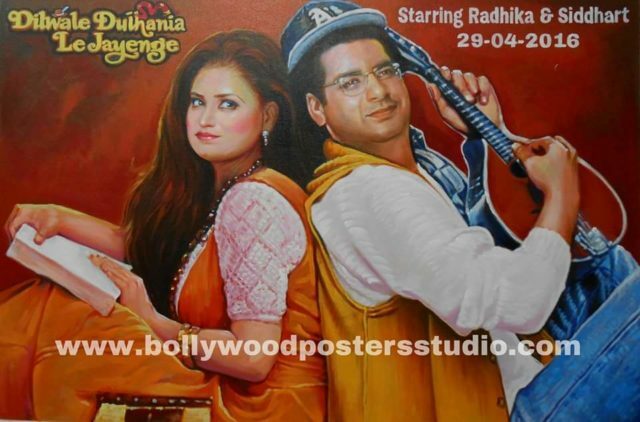 We will design your Personal Bollywood marriage poster using artist quality oil paints on artist quality, acid-free canvas. Recreate the magic of Bollywood on canvas by commissioning your very own Personal Bollywood marriage poster and make your special occasion very very special and remarkable memories of you friends and relatives.